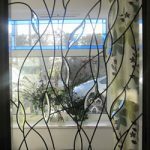 Satin glass is the perfect privacy glass for use in bathroom doors and other areas that glass with clear sections wouldn’t be suitable. 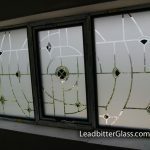 The glass has an etched glass appearance to the whole area of the glass and we can create many forms of our decorative glass techniques using Satin glass. 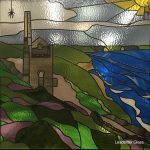 One product that works really well with Satin glass is our etched glass or Sandblasted glass as it is also known. 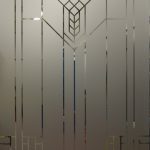 When creating an etched glass design using Satin glass we would etch the reverse side of the Satin leaving the Satin side unaffected by the sandblasting process. On the right we have an image of a recent job created for a client showing exactly how the etched glass sections of the design stand out well against the background of the Satin glass. 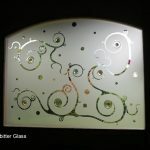 With normal etched glass there would be clear areas left in the design to allow the design to be seen against the etched background but with Satin, all of the non-etched areas are Satin glass so it is not possible to see through any areas of the glass. Satin glass is the perfect glass for use in bathrooms, wet rooms and en-suites because of the overall low visibility it offers through the glass and no matter what is behind the glass, people will not be able to make out anything other than fuzzy shades of light. 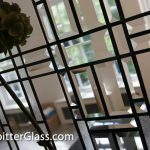 Satin glass still allows a lot of the natural light into the room and it does have a very modern feel to the glass without having a ‘too prominent’ pattern to the etched design effect. 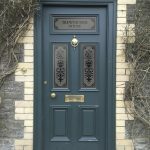 The Leadbitter Glass studio recently created a door and side panel combination for a bathroom door in Manchester and you can see the finished product here. 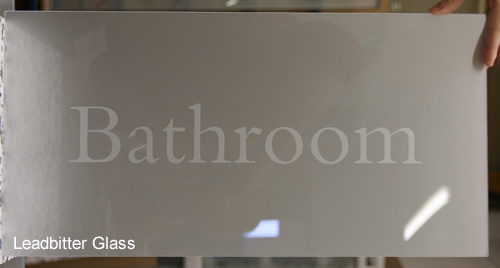 Once the ‘bubbles’ design was etched onto the back of the Satin glass we actually coloured the etched sections of the design a light blue colour using our coloured etched glass product and this gave a great effect to the new modern bathroom. 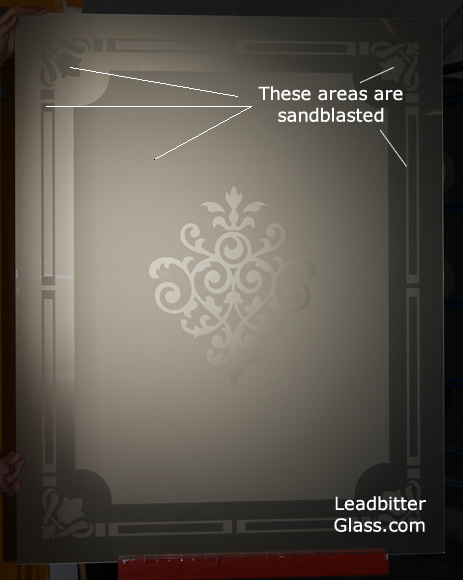 When the Satin glass is sandblasted the design will appear in a lighter shade than the rest of the Satin glass and here you can see an image that helps explain the effect achieved using Satin glass. 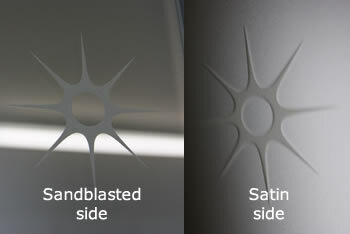 This panel was created for a toplight above a bathroom door. 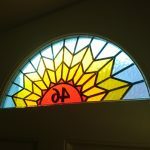 The glass is Satin glass with the wording sandblasted onto the glass.